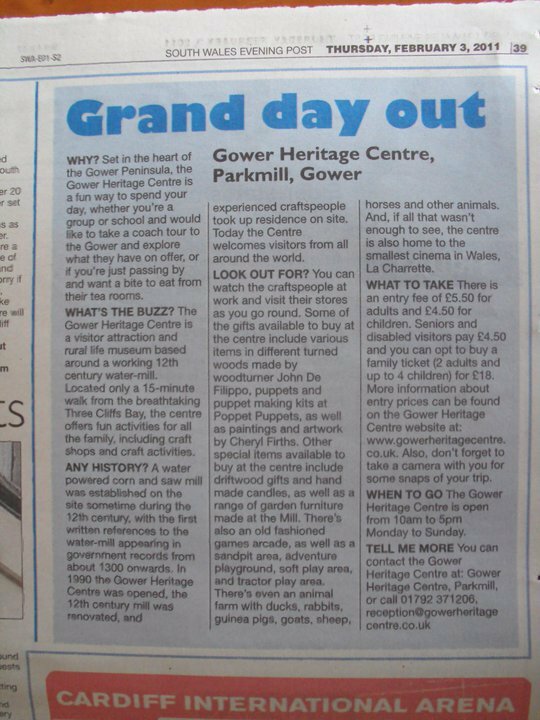 Below is my “Big Day Out” column from the Saturday, July 23, 2011, Swansea edition of the South Wales Evening Post. Tenpin Swansea, formerly Megabowl, is the only ten pin bowling alley in Swansea, located in the Parc Tawe shopping and leisure complex near the city centre. Tenpin Swansea offers a host of family friendly activities for people of all ages and abilities, from first time players right up to veteran bowlers. The alley boasts 26 bowling lanes, three American pool tables, an amusements arcade and cosmic bowling nights. Tenpin Swansea also offers a range of kids birthday party packages. Held every Saturday and Sunday morning, Tenpin’s Birthday Bash events are occasions to remember. For £12.00 per person you get two games of cosmic bowling, your choice from a selection off the Beach Road Cafe Bar menu, unlimited squash, as well as goody bags for all the kids. There is a minimum of six people for Tenpin parties, but they offer fun and excited for all children aged 12 years old and under. Bowling is one of the oldest sports still played in modern times. The earliest forms of bowling can be traced back to Ancient Egypt. In 1930 when the famous Egyptologist Sir Flinders Petrie excavated the grave of an Egyptian boy dating to 3200 BC, the explorer discovered artefacts resembling the pins used in tenpin bowling today. The first standardised rules for the pastime were established in New York City, on September 9, 1895. Today bowling is played around the world in over 90 countries. One game costs £6.49 for adults and £5.00 for juniors. Two games cost £11.49 (adults) and £9.00 (juniors), and three games costs £12.49 (adults) and £10.00 (juniors). There’s also special family deals available. Four people can play a game for £20.00 or two games for £35.00. Bowling shoes are provided. Food and drink are available. Their Beach Road Cafe Bar was inspired by the sun bleached, chilled-out beach vibe of Bondi, and is where you can relax with a burger and fries before or after you bowl. As well as normal ten pin bowling on some nights you can play cosmic bowling, a hybrid of glow-in-the-dark ten pin bowling with dance club music and lights. Up to date information about cosmic bowling times can be found on the Tenpin website listed below. At Tenpin Swansea there’s also an amusements arcade where you can try to win a prise on the claw machines, or, if you like, you can just chill out watching Sky Sports in the fully licensed bar or playing pool on the three American pool tables. The bowling alley is open 11.00am to 12.00am on weekdays and 10.00am to 12.00am on weekends. During the school holidays they are open 10.00am to 12.00am seven days a week. The bar closes at 11.30pm. For sat nav users their address and postcode is Parc Tawe, The Strand, Swansea, SA1 2AX. You can phone on 0871 873 3150 or book online at www.tenpin.co.uk/swansea. Below you can see my old “Grand Day Out” columns I wrote for the South Wales Evening Post before I started writing my weekly “Big Day Out” column on Saturdays. Just click on the photos to read them. 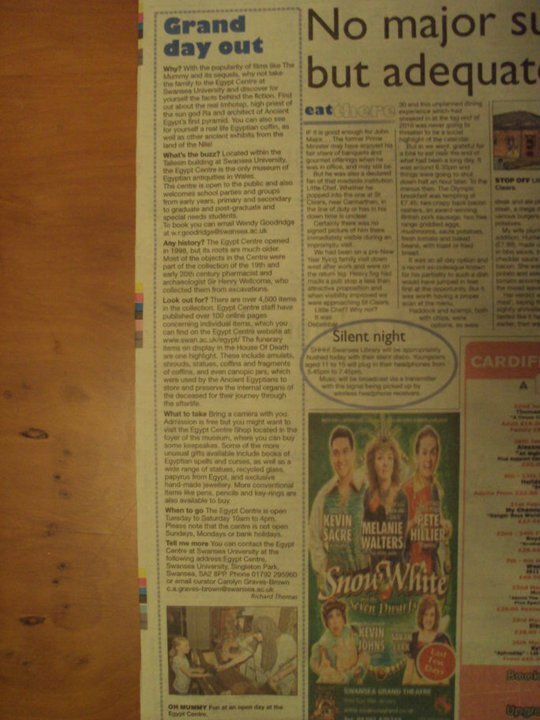 Below is my “Big Day Out” column from the Saturday, July 16, 2011, Swansea edition of the South Wales Evening Post. the Singleton Park Car Boot Sale in Swansea. What with the economic downturn car boot sales are a good way to save money and even make some extra cash and one of Wales’ five biggest is held every Saturday opposite Singleton Hospital in the car park of the Wales National Pool in Swansea. The Singleton Park Car Boot Sale is a well run car boot sale in the heart of Swansea which helps to raise funds for Singleton Hospital. Attendance barring bad weather is usually very good and there are lots of good deals to be grabbed. Father Harry Clarke, a Catholic priest from Stockport first introduced the car boot sale to the UK after seeing a similar event being held in Canada while on holiday there in the early 1970s. Car boot sales now happen regularly across the UK every weekend of the year. A carrier bag for your purchases would be useful. Food and hot drinks are available. You can choose between burgers and hotdogs or a healthy option. There’s also an ice cream van and a bouncy castle to keep the kids busy. If you want to have a go at selling your unwanted clutter, cars cost £10.00, and vans and cars with trailers cost £15.00. Aim to get there before 6.00am if you want a good pitch to sell from as the car park fills up very quickly. Goods available to buy typically include clothes, ornaments, pictures, books, toys and games, CDs, Blu-rays, DVDs, VHS tapes and even electrical goods like digital cameras and game consoles. Videos only cost 50p each and sometimes as little as 10p. There’s plenty for collectors. When I visited I saw on display classic Playstation, Super Nintindo and Gameboy games and consoles. There were also a lot of old figurines from classic kids TV shows and films like Star Wars and the Teenage Mutant Ninja Turtles. Some of which are worth a lot more money on websites like eBay for collectors. You might even find some new furniture. The car boot sale is open every Saturday all year round from 7.00am to 1.00pm. But begins to close around 12.00pm, so get there early. After 12.00pm prices start coming down if you want to look for some last minuet bargains. I bought a DVD of James Toback’s 2008 film Tyson for just £1.00, original price £5.00! You can find the Singleton Park Car Boot Sale across the road from Singleton Hospital Car Park. Go to Oystermouth Road, Sketty Lane, Sketty, Swansea, SA2 8QA. Details for this car boot sale and others can be found at www.carbootsaledirectory.co.uk. 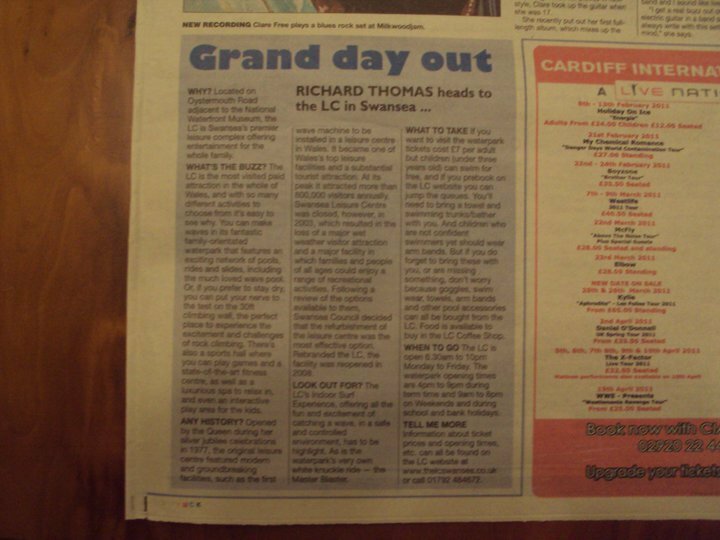 Below is my “Big Day Out” column from the Saturday, July 9, 2011, Swansea edition of the South Wales Evening Post. Ever wanted to travel back in time? If so, then why not enjoy an educational day out at the 1940s Swansea Bay Museum. With the winter months here, it’s fun for all the family whatever the weather. The 1940s Swansea Bay Museum is based in Crymlyn Burrows off the Fabian Way in Swansea. The Museum contains exhibits showing what life was like in the Swansea Bay area during and in the immediate aftermath of World War II. The Museum offers visitors a unique chance to discover for themselves what life was like for civilians on the “Home Front” during the war and experience the sights and sounds of an air raid first hand. You even get to find out what you could eat with a week’s rations and dress up in 1940s clothes and uniforms! Lots, it’s a museum after all. Most people have heard of the London “Blitz”, but the ports and industrial towns of South Wales were also targets for the German Luftwaffe, a three-night bombing campaign on Swansea in February, 1941, left most of the city destroyed. The 1940s Swansea Bay Museum was setup six years ago to tell the story of the impact of the bombing raids on the area, and how local people managed to cope with the devastation of total war. The Museum is preparing to mark the 70th anniversary of the bombing of Swansea, in February next year. There are many highlights. The Museum have just recently opened a new exhibit, an authentic wartime grocer's shop, where visitors can see what products available then are still on store shelves today. “Items like Spam, tinned beans and Weetabix are all here on display - although the Weetabix used to come in a tin rather than a box”, according to Museum director John Thomas. In addition short films and displays of actual material from the period help bring to life a time over 65 years ago when every Briton had to carry a gas mask and identity card with them. But the best part of the exhibition has to be the RAF plotting room, where you follow the course of the German bombers before taking cover in the air raid shelter! If you survive the German bombs, when the all clear sounds, you can stroll down the reconstructed 1940s street, past houses, shops and into the corner pub. Don’t forget to bring a camera with you. The Museum is open daily 10am-4pm (last admission 1 hour before closing). 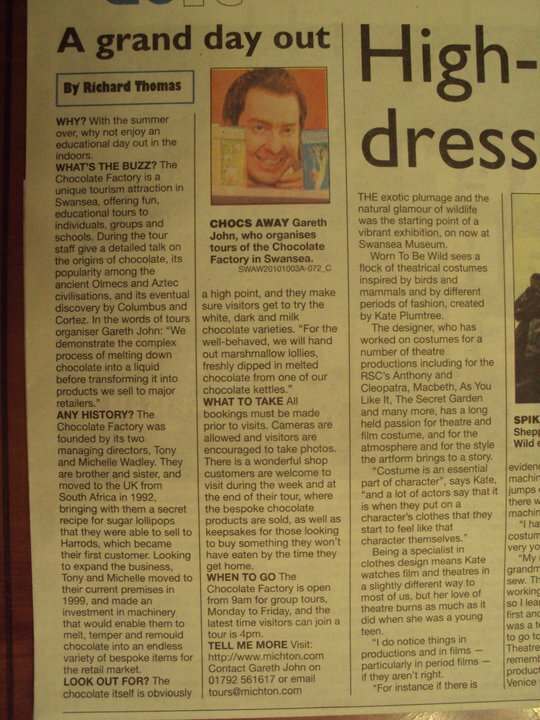 Below is my “Big Day Out” column from the Saturday, July 2, 2011, Swansea edition of the South Wales Evening Post. Folly Farm near Tenby in Pembrokeshire. Folly Farm Adventure Park and Zoo is the top paid-for visitor attraction in Wales and winner of the Best Family Day Out in Pembrokeshire. Located near the tourist town of Tenby in the beautiful Pembrokeshire countryside, Folly Farm offers affordable fun days out for the whole family. With six fun-filled amusement and activity zones, some of which are undercover, there is something to enjoy for all ages, whatever the weather. Folly Farm opened in 1988 following the decision by the owners, the Williams and Ebsworth families, to diversify from dairy farming into the leisure industry. In 1997 Pets Corner opened and in 2002 the first zoo animals arrived. More recently, in 2009, Folly Farm welcomed Wales' only giraffe to their zoo, a move that coincided with Folly Farm winning Premier Family Day Out at the Pembrokeshire Tourism Awards that year. Today Folly Farm attracts 400,000 visitors each year, making it Wales' top paid-for tourist attraction. Don’t forget to bring a camera with you. Tickets cost £9.00 for adults and £8.00 for children (3-15 year olds) on days when the park is open 10.00am to 5.30pm. On days when Folly Farm closes at 5.00pm tickets only cost £8.50 and £7.50. Toddlers two years old and under visit Folly Farm for free! Food and drink are available at Folly Farm’s Ploughman's Restaurant. Folly Farm's Jolly Barn is home to a huge variety of farmyard animals, including sheep, pigs, donkeys, horses, chickens and other farm animals. There's also loads of opportunities for children to get hands-on during the Pet Handling sessions in the nearby Pets' Centre which is home to rabbits, guinea pigs, tortoises, parrots and lots more. But with over 50 different species and more than 250 animals, Folly Farm’s zoo is the big highlight. As well as giraffe Folly Zoo has zebra, Bactrian camels, pythons and other animals to see. And with zoo keeper talks, the chance to watch the animals during feeding times, and a whole host of fascinating facts on Folly Zoo’s animal enclosure signs, you’ll go home knowing a lot more about the different species. But Folly Farm is much more than just a zoo. The 200 acre park is also home to Europe's largest undercover vintage funfair with a huge collection of working rides and stalls lovingly restored to their 20th century glory. A vintage big wheel and giant helter skelter ride sit just outside the funfair completing the old time funfair experience. And if all that isn’t enough there’s even a go-kart racetrack! Folly Farm will be open 10.00am to 5.30pm daily throughout most of April. You can check their opening times for a specific date on the official Folly Farm website at: www.folly-farm.co.uk. Their address is: Folly Farm, Begelly, Kilgetty, Pembrokeshire, SA68 0XA. For more information you can email info@folly-farm.co.uk or call on 01834 812731.